If the Power/Status LED indicator is still blinking after one hour, relocate the GPS antenna to receive a stronger signal (see Related Topics). “No Ethernet Detected Check Connections” The Ethernet port or connection is not working. The port connecting your device to the internet is not operational. Please check that your Ethernet cable is connected correctly and the switch, router, or internet gateway is powered-on (see Related Topics). “Not In-service The Network Extender has not acquired the initial GPS location or has lost GPS signal for more than 24 hours due to poor or inadequate GPS signals. The Network Extender is Not In-service. There is a failure in the GPS module preventing your device from functioning correctly. 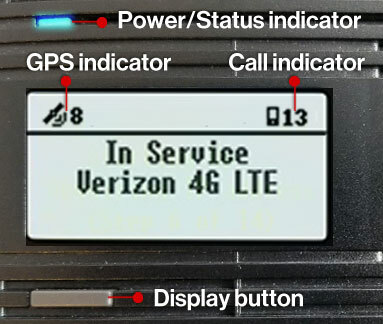 The initial GPS fix can take up to 60 minutes in poor conditions. Please make sure that the GPS antenna is installed in a location near a window (see Related Topics).